We love HSN rock god Jay King, but we have a bone to pick about his Today’s Special. Exactly how unique is his turquoise ring? We sent it back, because we don’t like “block” turquoise, which is bits of turquoise compressed together. Now Deasy’s ShopNBC ring may not have been Sleeping Beauty turquoise, it’s true, But it looks very much like King’s ring, with that bronze-gold matrix. And the ShopNBC ring was prettier than King’s. So exactly how “absolutely one of a kind” is the TS? We don’t know if the Deasy ring was done by the exact same process that King used, but they sure look alike. Technically, any turquoise ring is one of a kind, because no two pieces of turquoise are the same, we suppose. 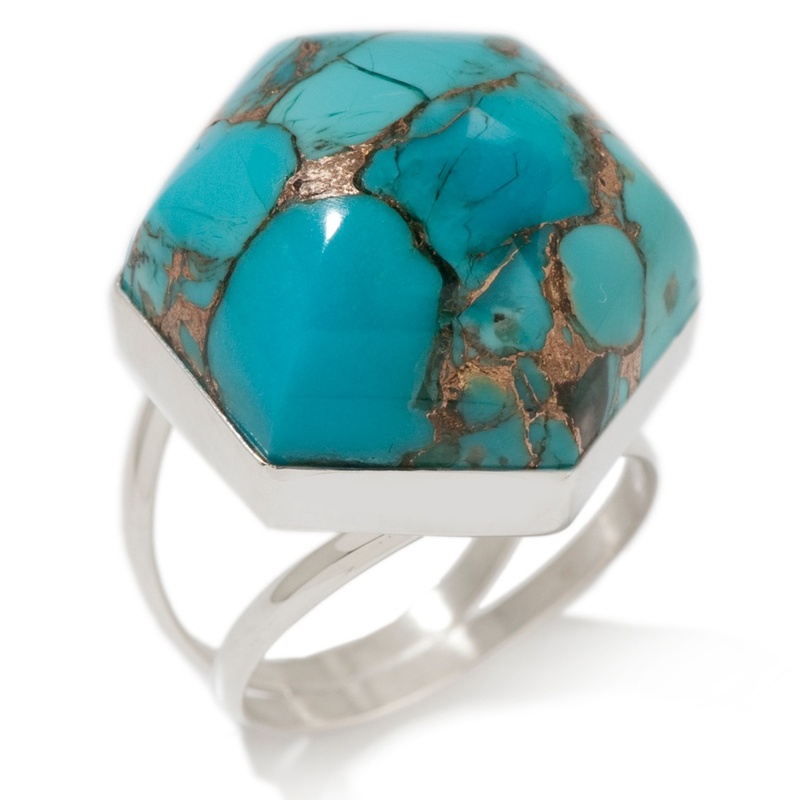 Check out the ShopNBC ring for yourself, and you decide how similar the turquoise is to King’s TS. Rock god Jay King will be on HSN this weekend with the Today’s Special, in Sleeping Beauty turquoise, accompanied by two of his turquoise cronies. Word is that King will be on HSN with Monte Nichols, the owner of the Sleeping Beauty Mine, and Marty Colbaugh. 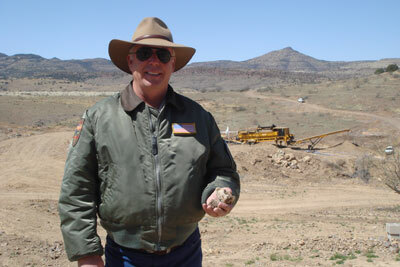 the owner of the Kingman Turquoise Mine. All in all, King will on on the air 18 hours this weekend..
BTW, King is looking for more his his fans to like his company’s Facebook page, Desert Rose Trading. We “like” it, and often are made aware of big sales via Facebook. Songwriter Diane Warren is coming to HSN next week. She will be on the home shopping network with to present “Due Voci: The Music of Diane Warren” on HSN during a live one-hour primetime special of her greatest hits on HSN on next Thursday at 11 p.m. Throughout the evening, Warren, a songwriting machine who has written some of the most recognizable lyrics over the past 25 years, will share with viewers the inspiration behind her iconic songs. Due Voci, the duo she developed with Grammy-winning producer Humberto Gatica will be performing her songs, with Kelly Levesque and Tyler Hamilton doing the vocals. “I have found the perfect voices in the pairing of Kelly and Tyler after searching for two years and I am delighted to share with HSN viewers the inspiration behind these deeply emotional songs,” Warren said in a canned statement.. Right now you can pre-order a special CD with three exclusive tracks available for HSN customers only at hsn.com and via HSN mobile for $11.95. Singer Mary J. Blige walked off with the equivalent of the Oscar for fragrances, a FiFi Award, this week for the fragrance she launched on HSN. Blige’s My Life perfume, which came from the Carol’s Daughter company, was honored with Breakthrough Fragrance Sales of the Year and Fragrance of the Year awards. The awards recognized the unique, pioneering approach Carol’s Daughter and HSN adopted for the launch of the scent. More than 100,000 bottles — that’s not so shabby. Of of course, HSN CEO MIndy Grossman put her two cents in, too. Jennifer Lopez, who we enjoyed on “American Idol,” will be on HSN July 2 to debut her new perfume. That’s quite a catch for the No. 2 home shopping network. HSN host Colleen Lopez — no relation to the diva — posted this on Facebook today. HSN is running a Love and Light Sweepstakes that gives you a chance to meet Jennifer while she’s on HSN. “Share with your friends, and get additional entries to increase your chance of winning! ENTER NOW: http://on.fb.me/meet-jennifer-lopez-hsn,&#8221; HSN said. It sounds like ex-QVC host Patti Reilly a ready to hit the road and head out to the Left Coast. For her Facebook photo, Reilly is wearing a hot pink T-shirt that says “Califreakinfornia.” We likey. On May 8 Reilly wrote on habout coming back from LA and finding a place to rent. Reilly, like Oprah Winfrey, is also a big believer in “The Secret,” according to her blog. And we actually believe this crap, too, despite the fact that one of its authors is the crackpot responsible for several people dying in a sweat lodge in our beloved Arizona..
“And like the Law of Attraction says: if you focus on lack, you’ll be in a place of lack,” Reilly blogged. “If you focus on abundance, you will draw it to you. I found it easier to envision success than I did the family/relationship stuff. Posting affirmations on the mirror or in a notebook to remind myself that life is what I make it just seemed like the best way of thinking. Even today I have to remind myself to shift my thoughts- especially now when I’m making all of these changes. Each day I pack another box, or make another list, I have to battle fleeting thoughts of doubt. But when I come across thoughtful notes and beautiful pictures and remember that this one life is just stretching itself out in front of me, I know that I’m doing the right thing. We got home from a very long day Wednesday, turned on QVC and saw a designer we didn’t recognize. It was George Simonton, with a total makeover. He is a sweetheart, but we’ve criticized his hair and attire in the past. He looked about 20 years younger today. He dyed his hair dark, grew a beard and got a hip hairdo. The only thing we don’t like about his new look are his glasses, which have very heavy, dark frames. Komen for the Cure founder Ambassador Nancy G. Brinker will appear live on HSN on Thursdayat 2 p.m. and 8 p.m. to debut an exclusive, limited-edition Promise Me gift set. Her appearance is part of HSN Cares’ fifth annual Shop for the Cure campaign, which runs during the whole month of May. The first official fragrance to benefit Susan G. Komen for the Cure, Promise Me offers folks an opportunity to contribute to breast cancer research and recognize those who have been touched by the disease. Eau de Parfum: The sophisticated floriental opens with a fresh burst of mandarin, bergamot, and blood orange. Its feminine heart evokes softness and beauty with pink peony, wild orchid, and rosewood. The scent lingers featuring white patchouli and musk for a warm, sensual finish. Shower Gel: Experience a gentle shower gel made with the scent of Promise Me. Body Cream: This rich, pampering cream infuses the alluring scent of Promise Me into a nourishing hydrator for soft and smooth skin. Scented Bracelet: Share your commitment to the cure and make a style statement with this lightly scented Promise Me bracelet. Each Promise Me gift set will also include background information about Susan G. Komen for the Cure as well as the contribution each purchase makes to the organization. In 2011, Promise Me creator TPR Holdings has committed to donate a minimum of $1,000,000 to Susan G. Komen for the Cure for breast cancer research, education, screening and treatment. Pricing & Availability: $44.90, on HSN beginning May 26 and now on hsn.com. Barry is back, and QVC has him. Crooner Barry Manilow will appear on QVC Thursday at 8 p.m. to unveil “15 Minutes” – his first original album in 10 years. For this “QVC Presents QSessions Live” broadcast, the Grammy, Tony, and Emmy Award-winning artist, as QVC describes him, will perform a selection of songs from his new album while giving viewers insight into the inspiration behind the collection. 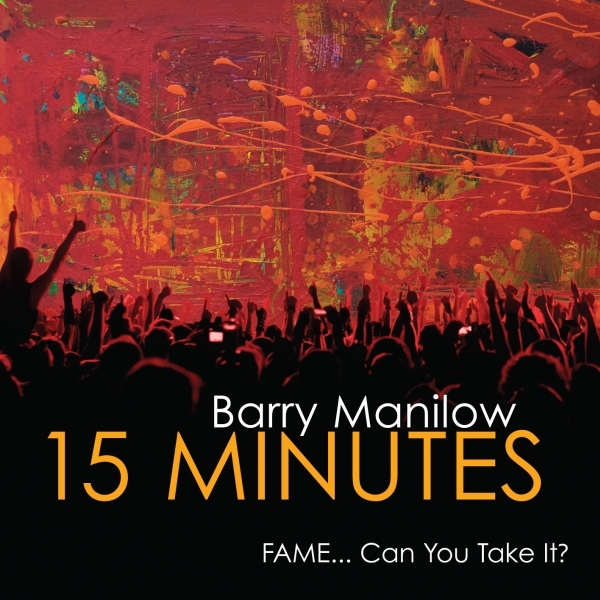 Manilow’s aficionados will be able to purchase “15 Minues”more than two weeks before it drops. Just for QVC, “15 Minutes has been packaged with a bonus CD of four previously unreleased tracks. After recording six albums of songs written by other songwriters, “15 Minutes”I is a collection of 16 original tracks written by Manilow and lyricist Enoch Anderson. The new album explores the perils and pinnacles of fame’s double-edged sword and was inspired by Andy Warhol’s quote: “In the future, everybody will be world famous for 15 minutes.” Making a guest appearance on ’15 Minutes’ is young Nataly Dawn, lead singer of the white-hot group “Pomplamoose.” Her rendition of “Letter From A Fan” is both innocent and eerie. Manilow is no stranger to QVC. His 2006 QVC appearance marked the highest single-day sales by a musical artist in QVC history, and he also continues to hold the record as the highest single-hour music sales event in QVC’s 24 years. ’15 Minutes,’ with bonus CD, will be available starting Thursday at QVC. HSN host Colleen Lopez tipped us off again: Jersey Girl Queen Latifah is coming to HSN! Here is Colleen’s post on Facebook, but the news was in an HSN press release today. Here’s what Latifah told Women’s Wear Daily about her line including “plus” sizes. We weren’t invited to the preview event that was apparently held today. 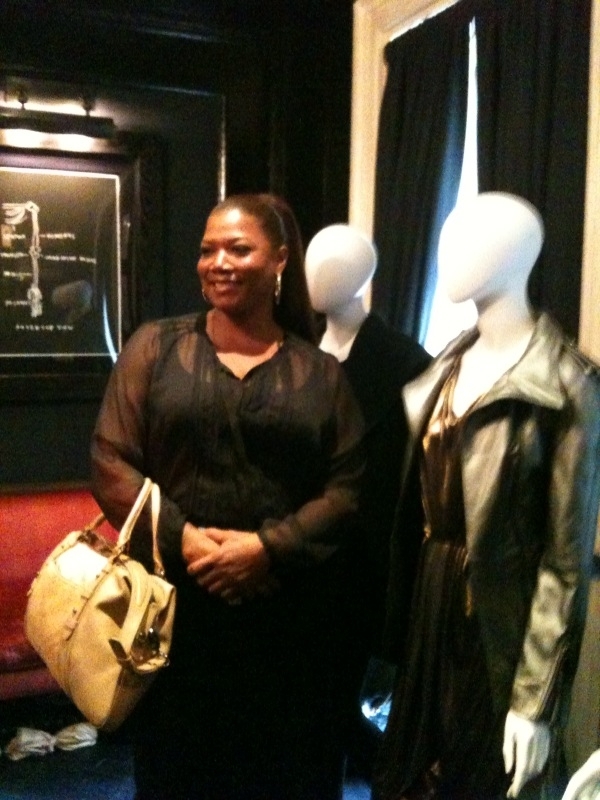 ST. PETERSBURG, Fla., May 23, 2011 /PRNewswire/ — Queen Latifah, winner of Grammy, Golden Globe and SAG awards, has partnered with leading multichannel retailer HSN for the exclusive launch of the Queen Collection, her first-ever lifestyle brand. On August 27, Latifah will debut a unique collection of apparel, handbags and outerwear, and will introduce a hair extension line in September. The premiere will feature designs inspired by her personal style and design aesthetic. Queen Latifah is an inspiration to women everywhere based on her unbridled success in music, television and film. Conscientious of her stature as a role model and fashion icon, Latifah created her new collection to inspire women to find their own personal style. The Queen Collection offers women fashionable wardrobe-building pieces of apparel and accessories at accessible prices. A shot from the HSN preview for the Queen that we weren't invited to. HSN and Queen Latifah have collaborated to create designs that compliment a variety of body types. Inspired by silhouettes that have been adapted from Latifah’s personal wardrobe and fused with her background in the equestrian world, the Queen Collection features sleek riding pants, slouchy blazers, ruffled blouses, fringe ombre scarves and a suede moto jacket. The Queen Collection apparel and outerwear lines are grounded with easy-to-wear basics, casual sweaters, great fitting jeans, leggings and tees. Priced under $100, the apparel line focuses on layering pieces such as jackets and coats. The line’s handbags and outerwear styles are all constructed in genuine leathers and suede and are priced between $170 and $300. These designs feature studded details, zippers and moto silhouettes. Following her first on-air appearance on August 27, Latifah will return to HSN in September to debut a custom line of Natural Wavy Clip-On hair extensions. Women everywhere will have access to high quality, 100% Remy Indian hair extensions at accessible prices. Available in a range of colors, including black, shades of brown, auburn and shades of blonde, the Queen hair extension collection starts at just over $100. Queen Latifah is currently scheduled to appear on HSN starting on Saturday, August 27 at 12:01 a.m. (EDT). More information on the upcoming launch of the Queen collection can be found at hsn.com. You are currently browsing the Homeshoppingista's Blog By Linda Moss blog archives for May, 2011.